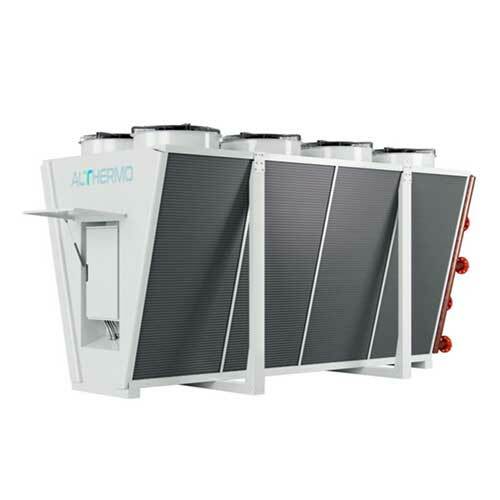 ALTHERMO liquid coolers have been designed and built in a modular system to fulfil any installation and application requirement. The frame components are made of galvanized steel, powder coated with a coverage of 80 microns, guaranteeing C4 corrosion resistance. All the fastening elements are in AISI 304 grade stainless steel. The coils are built with the most suitable shape, tube diameter and fin pitch for the specific configurations, so that each device can achieve maximum power per unit volume and occupied surface. The capacities are calculated with the latest and most sophisticated calculation methods and are validated on real units with a Ambient Air Temperature (AT) of 25 °C, Fluid Input Temperature (FIT) of 40 °C and a Fluid Output Temperature (FOT) of 35 °C. Fluid: Water. The standard fans used are brushless EC to ensure compliance with the current and future ERP2020 regulation, as well as optimal performance levels, efficiency and low noise emissions. 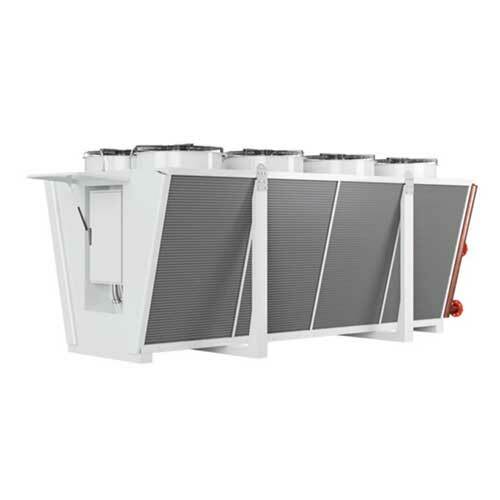 Three-phase and single-phase AC fans can also be fitted on request. In addition to the ranges in the catalogue, non-standard size equipment can also be supplied, such as dry coolers operating at extreme operating temperatures (ambient temperature up to 40 °C and fluid input temperatures up to 90 °C). 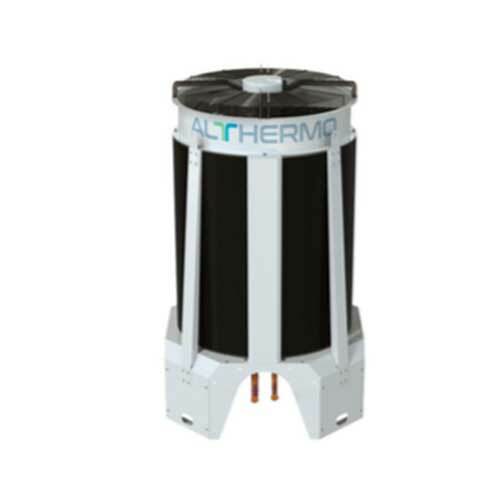 DMR is a revolutionary modular dry cooler that ensures ultra-high specific power, thanks to the combination of technological solutions designed and tested by Althermo. The exchange surface of the microchannel heat exchanger, thanks to the special cylindrical shape, is 50% higher compared to a traditional configuration with the same footprint. 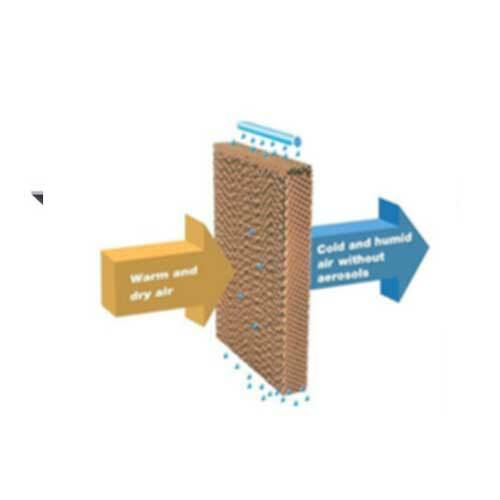 This characteristic, in addition to the possibility for the heat exchanger to be installed very close to walls, ensures a remarkable reduction of the entire installation surface up to 75%. The DMR module is the highest expression of energy efficiency on the market of dry coolers and it can be provided individually as a single module (to be mounted on the installation site) or in combination as a multiple modules configuration. The standard version is provided with EC fans but AC fans can be mounted as well. In addition to this, other options for DMR are available: protective coating in case of heavy duty sites of installation (inox frame and ElectroFin treatment on the heat exchanger) and closed-circuit operation through the installation of another plate heat exchanger with recirculating pump. The only modular Dry Cooler on the market which can be transported by standard lorry or container and, by dividing the radiant power, guarantees the same power as much larger devices which can only be transported on special trucks. 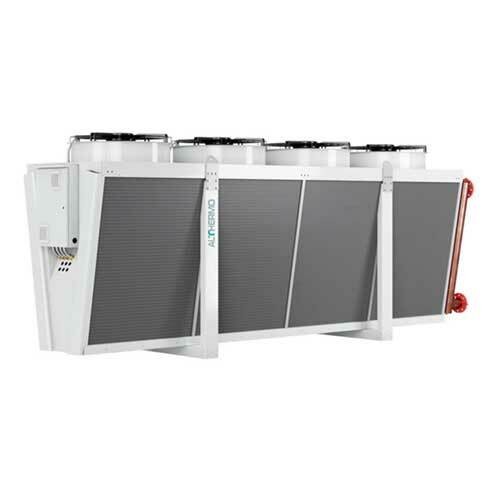 The only modular Dry Cooler on the market designed with the EMI (Easy Modular Installer) concept which can be installed in sections and assembled on-site. This means a one megawatt plus Dry Cooler can be installed with an 800 kg load-bearing crane with enormous benefits in terms of logistics and installation costs. The EMI system also allows you to expand the power of the equipment by adding sections later. system in combination with AOP, patented by ALTHERMO. Of all the V-Shape devices, the Great model is the one which guarantees the greatest power. The Althermo construction system (ATF) also guarantees the structure is highly resistant during transportation and installation. The Encased Electrical Panel reduces the overall size of the machine while also protecting it from adverse weather conditions. The Great model guarantees internal accessibility via wide doors located on the manifold side. The Intermediate model is configured for transportation by standard lorry or container. The Encased Electrical Panel reduces the overall size of the equipment while also protecting it from adverse weather conditions. The Intermediate model ensures a good compromise between power, ease of installation and maintenance. Internal accessibility is guaranteed by the wide doors located on the manifold side. The main feature of the Small model is its size which makes it suitable for low visual impact installations. With a maximum height of 2085 mm and a single row of fans, it guarantees the highest power for its category in minimum space. 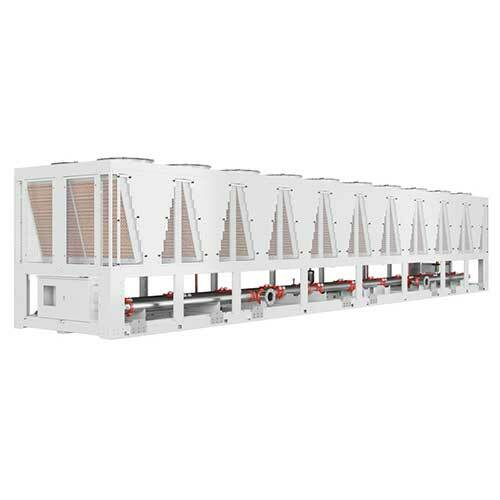 The Table Type dry cooler family has a very wide power range and the HV bi-flow design means the same device can be installed both with vertical air flow and horizontal air flow. This feature gives the designer greater flexibility in his project layout. Having analyzed in depth all the pros and cons of the adiabatic systems on the market, Althermo designed INTELLIBATIC, an adiabatic system that combines all the benefits of a PADS system and eliminates its sole limitation. This led to the creation of the adiabatic system designed for Althermo modular machines which, by integrating AOP System technology with an innovative management software, gives Althermo dry coolers and modular remote condensers the highest overall efficiency compared to any other machine on the market. LOWER PRESSURE SPRAY system: this is a very simple, low-cost system which sprays a fine mist of water (micro droplets) in the air sucked in by the ventilated machine. This causes the temperature of the air being sucked in to drop, increasing the delta T and as a result, the performance of the ventilated machine. The limits of this system, however, derive from the fact that these micro droplets can humidify the air up to a maximum of 80% and with an“adiabatic jump” of maximum 30%. This means that, in optimal conditions, amaximum 5-degree air temperature decrease can be achieved. Moreover, the finned block must be treated because calcium deposits form on the fins during use, causing corrosion in the long term. The maximum operating period is, in fact, 150 hours per year. HIGH PRESSURE SPRAY system: this system is similar to the previous one with added advantages, but more expensive. The water is atomized at high pressure, from 10 to 80 atmospheres by means of a pump. The resulting micro droplets are much smaller compared to the low pressure system (Misting effect) and the adiabatic effect is greater. An approximately 85% saturation can be achieved with about a 7 °C drop in air temperature. The limits of this system are the cost of treating the finned block, the loss of overall efficiency due to electricity consumption by the large, high pressure pump and increased noise emissions due to the addition of the pump. For this reason, the recommendation is not to exceed 200 operating hours per year for this system. 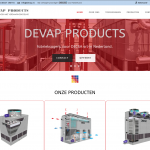 PADS system: this is by far the best adiabatic system in terms of performance. In this system, the water passes through and wets a plastic or cellulose panel fixed on the inlet side of the ventilated machine. The air sucked in by the ventilated machine passes through the panel and absorbs the moisture of the water, lowering the temperature. PADS systems can humidify the air up to 94-96%, decreasing air temperature by 9 °C. 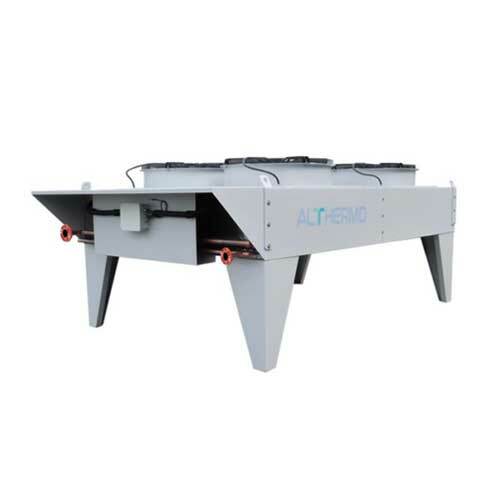 Moreover, since the water does not come into contact with the finned block, the latter does need any surface treatment and the system can operate for up to 8000 hours per year. The PADS system has one major limitation, however. Under the normal working conditions of a ventilated machine, there are room temperature and humidity conditions that do not require the use of an adiabatic panel or make it efficient. Indeed, under certain conditions, the system prevents the passage of water. 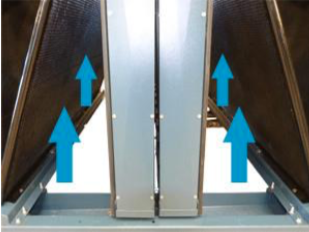 Under these conditions, however, the fan loses load capacity unnecessarily because the panel, even though it is not sprayed with water, hinders the passage of the air intake. As a result, the fan becomes less efficient because it must consume more energy to guarantee the same capacity. To achieve a perfect system, you would have to remove the adiabatic panel whenever conditions dictated that it was not needed. In the INTELLIBATIC system, the adiabatic pads, when they are not needed, open automatically, controlled by the electrical panel, thus allowing the device to reconfigure itself to dry conditions as efficiently as possible. For this reason, the INTELLIBATIC system is overall the most efficient adiabatic system: it“independently decides” the most efficient configuration based on the actual environmental conditions. Thanks to the recirculation system, the INTELLIBATIC system also limits water consumption to evaporation, so the water consumed is only what is transferred to the air to lower the temperature. This system, which can be used both with Dry Coolers and Remote Condensers, allows you to automatically exclude adiabatic panels from the flow of incoming air when the relative humidity conditions and the room temperature do not make it efficient to work in adiabatic mode. Adjustment No inverter-controlled or phase-cut AC motor can go down to such a low rpm. A major advantage especially for all season processing plants and night operations. No risk of abnormal vibrations at low rpm. Direct relation, in terms of energy consumption, between the lower rpm and the containment of power used. In other words, the EC fan uses less energy when it slows down. A logical relation not fully guaranteed by AC solutions with adjustment. Average life not affected by adjustment. Unlike AC motors which, although of excellent quality, have a shortened life span if adjusted by phase cut, the adjustment, even with highly variable rates, does not affect the durability or reliability of the fan with an EC motor. A single code for two frequencies, different voltages and two markets. The EC fan ranges from 380 to 460 V, 50/60 Hz and CE certification, as well as UL-CSA. Rapid payback. The EC fan, especially on types with 800-900 mm diameters, has a rapid payback and gives a return on investment in ten years around twice its value. Less bulky electrical panel due to the elimination of the regulator. No additional cost for shielded cable. One of the aspects that should be always taken into consideration in HVAC industry is prevention of damages and deterioration of components, even in the worst conditions. In particular, corrosion often affects heat exchangers and can lead to performance loss and failure. It is therefore very important to provide adequate protection in order to avoid or delay corrosion and its effects. Althermo can providedifferent coating solutions, according to the type and the site of installation. In fact, not every application is under high risk of corrosion and in those cases there is no need for special coatings. Instead, some environmental conditions or some types of application present high risk of corrosion that should be prevented or reduced. In such scenario consideration of environment and of application is essential to provide the more resistant solution. Environments that put equipment under high risk of corrosion are: coastal and seaside areas, rural areas, polluted urban centers, industrial zones, desert zones. From an installation point of view, types of application with high risk of corrosion are: power stations, chemical, fuel and gas industry, waste disposal and sewage treatment industry. For all applications and environmental conditions where standard coatings are inadequate, we at Althermo can offer a special coating treatment that provides the highest and best protection from corrosion. This special coating is ELECTROFIN, a factory-applied electro-deposition coating process that guarantees complete heat exchanger coverage. The coil is immersed in a bath. Here the coil acts as a magnet and attracts the coating to every surface. The result is a thin, flexible, durable, corrosion-resistant coating. Main feature of this special coating is that, whereas other coating processes fail in covering the entire surface, especially in particular structures such as microchannel or round tube plate coils, ELECTROFIN coating penetrates deep into the 100% of coil surfaces, covering all edges and filling all cracks. In addition to this, the final stage of the ELECTROFIN coating process provides anextra UV-Resistant Topcoat: a layer is applied by spray to protect the ELECTROFIN coat from UV and ensure durability and long life to coils and microchannel. The EEP innovative construction system allows you to position the electrical panel inside a compartment within the machine frame. All the electrical components thus benefit from added protection from atmospheric conditions and the overall dimensions of the machine is decreased by at least 400 mm. Als we niet aanwezig zijn kunt u via dit formulier snel contact met ons opnemen.